Here at Sinclair & Co., we tend to develop long-term, close-working relationships with our clients. Naturally, we want to brag on them when they reach new milestones. So meet today’s focus of #ClientBragging. Creating IT Futures (CITF) is the leading charity of CompTIA, the world’s largest IT industry association. CITF’s mission is to help the technology industry find needed workers— and help workers find more opportunities through research, program development and partnering. Most notably, CITF encourages an IT career path for populations that have typically been underrepresented in the technology workforce, such as women and minorities. Who wouldn’t be proud to support these life-changing efforts? In the nearly five years we’ve served as agency of record for CITF, we’ve helped brand and promote a number of initiatives. So it’s exciting to see CITF’s flagship program, IT-Ready, expand into new markets offering unemployed and underemployed adults no-cost training, certification and placement in entry-level information technology jobs. 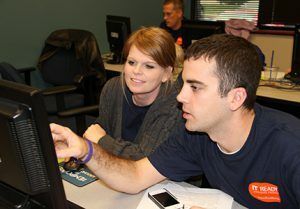 IT-Ready will soon be available in 12 markets across the country, including two new ones, Charlotte and San Luis Obispo. At Sinclair & Co., we salute CITF for their success and are proud to support their efforts through branding, blogging, content development, media relations and other marketing efforts. Take a peek at some of the award-winning work we’ve developed for CITF over the years. Not to brag or anything.